A man suspected of swallowing a $20,000 (£12,600) diamond is being held in custody in Windsor, Canada, until it passes through his system, police say. Richard Matthews allegedly swapped the gem for a fake and ate the real one.The incident occurred almost a week ago but the stone has not appeared despite numerous visits to the bathroom.Mr Matthews, 52, was initially being fed fibre-rich foods, but is now eating whatever he wants in order to speed the process, Sgt Brett Corey said. An X-ray revealed a pair of artificial diamonds, known as cubic zirconiums, in Mr Matthews' intestines. 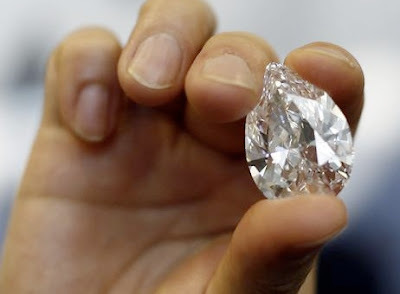 But the translucent quality of the real diamond means it does not appear in screening.The suspect is eager to get the ordeal over with, Sgt Corey added, and is co-operating with police. The 1.7 carat jewel was taken from Precision Jewellers in the Canadian province of Ontario.Mr Matthews has been charged with theft and breach of court conditions. He is also wanted on warrants in Toronto.